The 4.5 Kg CIST/88 with GPS Clegg Impact Soil Tester manufactured by SDi provides an easy and straightforward means for measuring and controlling soil strength and consolidation levels during trench re-instatement. The 884 readout is clamped to the guide tube and the displayed reading is viewed from the top during use. Single button operation design provided for easy use. On board data logging and data storage with wireless data transfer facilities are provided with the CIST/884 instrument. Latitude & Longitude coordinates of the test location are received by the in-built GPS then stored providing users with an accurate location reference for later viewing in eg Google earth™. Users can download their site test results to a PC wirelessly by Bluetooth, using the PC software supplied with the instrument. This cable-free operation greatly enhances system reliability. The instrument is used to confirm uniform compaction of over wide areas of ground, identifying poorly compacted areas and ineffective rolling of materials. The CIST/884 Clegg Impact Soil Tester is a very rugged design suitable for prolonged use in damp, dirty and harsh site environments. The CIST/884 readout unit is made from high strength alloy that has been proven to last for decades. The instrument runs from 2 x ‘C’ batteries for typically 12 months operation. The CIST/884 Clegg Impact Soil Tester is a compact and reliable instrument. A wooden Transit & Storage Case is included. 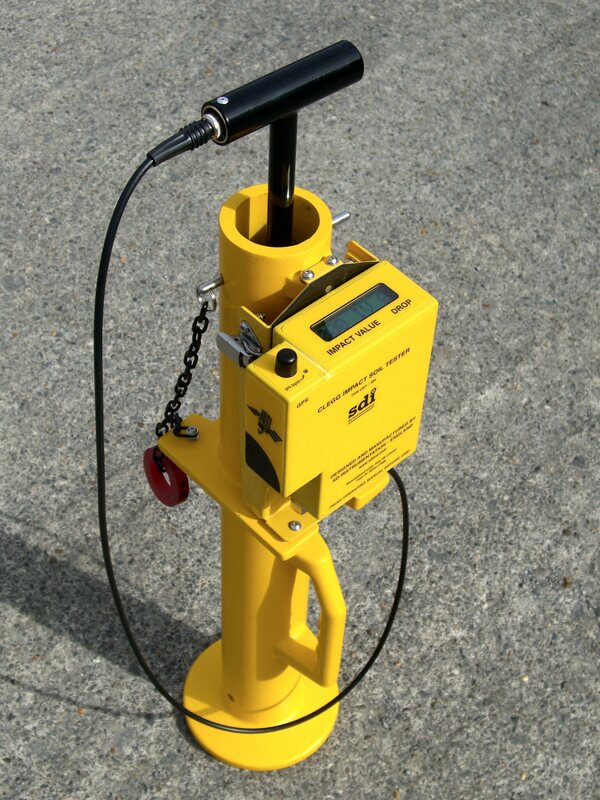 The Tester consists of a 4.5 kg compaction hammer operating within a vertical guide tube. The Hammer falls through the tube when released and strikes the surface under test, decelerating at a rate determined by the stiffness of the material within the region of impact. The readout registers the deceleration in units of Impact Value (IV). The IV is an indication of soil strength. Good correlation with results from CBR tests exists. Data from the CIST/884 can be used in a similar manner to results from CBR tests performed in the laboratory and in the field. The CIST/884 display when enabled by the user can directly show the %CBR result based upon Dr Clegg’s original pioneering work. operators employing the recommended test routines. issued in 1995, entitled “Standard Test Method for Determination of the Impact Value (IV) of a Soil”. The Clegg Impact Soil Tester is designed, manufactured and marketed by Simon Deakin Instrumentation (SDi, UK) under an exclusive licence from Dr Baden Clegg, the original Australian inventor. 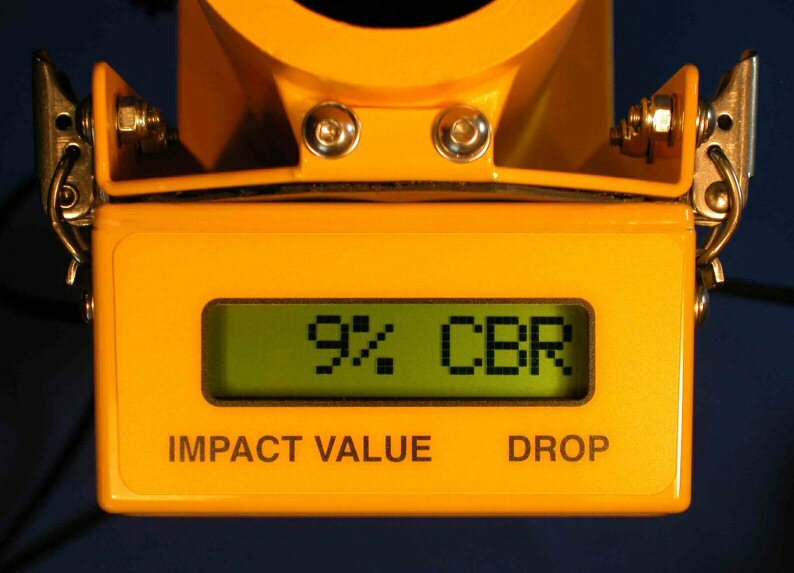 The Readout Unit displays readings of Impact Value (IV) and also shows the number of times that the hammer has been dropped during each test operation. The number of GPS satellites detected is also displayed confirming successful GPS location fixes. Carrying out a test is quick and straightforward. The ground surface is brushed lightly with the foot to remove loose material and the guide tube is placed in position. The digital readout is located on the guide tube shown on the right during testing. The miniature high gain GPS antenna receives the satellite signals. The hammer is raised to a height of 450 mm as indicated on the hammer head and then allowed to fall freely. This procedure is repeated four times, the reading achieved on the fourth drop being recorded as the Impact Value. Software selectable %CBR display and recording is supplied. An automatic GPS measurement is taken with the hammer drops providing a Lat / Long fix. Tables of target IV for a range of backfill and subgrade materials are given in the operating manual, enabling the operator to check the compliance of reinstatements with the specification levels. 4.5 Kg (Also for sports surfaces: With 2.25 Kg and 0.5 Kg Hammers). Backlit vertical display. 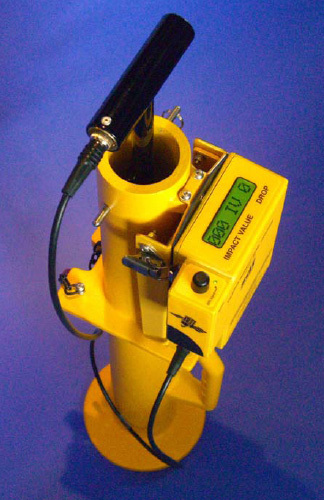 Readout unit clamped to Guide Tube – Easy to view. Low power 3V: From two ‘C’ Cells. 12 Month typical battery life. Flash Memory for approx 10,000 5-drop tests. Each field contains the 5 drop IV readings, time & date of each test, latitude, longitude & no. of satellites. Bluetooth™ Wireless data transfer. No cables & hence hassle free connection to Microsoft based PC or laptop. Bluetooth USB Dongle provided. Comma Separated Variable (CSV) data for manipulation in 3rd party packages such as Excel™ & KML readable by eg Google earth™. Viewable directly in Google map™. Calculates & stores Ordnance Survey GB Eastings & Northings. Typically < than 5 metres. Google map™, Google earth™ & Ordnance Survey GB Easting & Northing to 1m res. (eg “ST 80269 55704” & “E380269 N155704”). Software Selectable %CBR display & memory storage. Type CIST/WTS/09. Wooden case for added protection in transit. 71 x 13 x 13 cm. Instrument weight 6.9 Kg. Packed weight in case 12.0Kg.